Detailing the physical features, habits, territorial reach and other identifying qualities of the Blue-fronted Dancer. The slender Blue-fronted Dancer is a Damselfly that flits, flutters, and bounces as it flies making it a natural choreographer. Dancers' flight patterns are not straight-lined. This pond damsel appears to dance and bounce along its way. Damselflies are are smaller than Dragonflies, but they can be just as colorful. Males have light blue eyes and a blue thorax. The long, thin abdomen ('tail') is dark brown with blue along the side near the body. A bulge at the tip is also blue. Females have a blue form, but also a brown one. Their eyes are not blue and the bulge at the tip of the abdomen is brown. 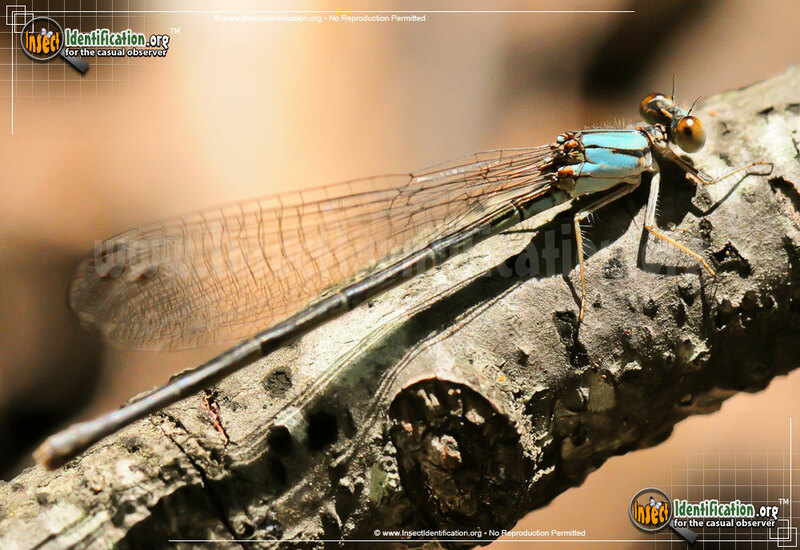 As a member of the Narrow-winged Damselflies family, their wings are very thin where they meet the body. When resting, they fold their wings above their body. The Blue-fronted Dancer is typically found near water (ponds, streams, creeks, riverbanks). They rest on low shrubs, branches, tall grasses, and logs. They are active all through summer. Males defend territories against males of any other damselfly species. Females lay their eggs on floating objects in water. The majority of the life cycle is spent in the water as a naiad (juvenile form), breathing the dissolved oxygen from the water through gills found at the tip of their abdomen. Naiads are terrific aquatic predators with huge appetites, eating insects, worms and even small fish. Their extendable lower lip allows them a long reach. Quick expansion and a set of teeth secure their prey. Because of its appetite for insects, Blue-fronted Damselflies are beneficial to a riparian ecosystem, keeping populations of smaller insects in balance. Once they mature, naiads shed their exoskeleton on land and emerge as flying adults.